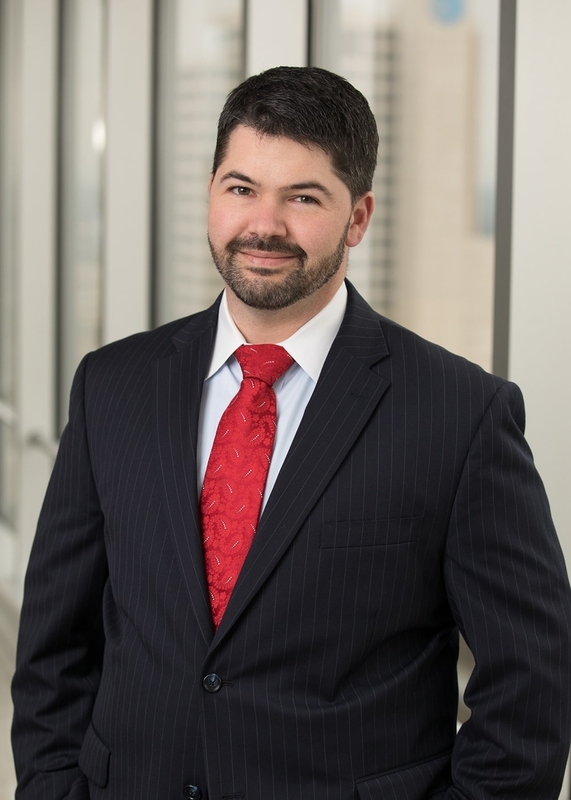 Aaron P. Borden is an associate at Meadows, Collier, Reed, Cousins, Crouch & Ungerman, L.L.P. He is Board Certified in Tax Law by the Texas Board of Legal Specialization. Mr. Borden’s practice is focused on representing taxpayers in tax controversies with the IRS and the Texas Comptroller, and representing white-collar defendants in criminal investigations and controversies initiated by the Department of Justice, IRS and other government agencies. Mr. Borden’s representative trial experiences include a month long multi-defendant securities fraud trial in the Western District of Texas and a pending civil forfeiture case in the Northern District of Texas regarding a fossilized Tyrannosaurus Bataar skull. Mr. Borden’s representative administrative experiences include: obtaining waiver and abatement of $1.3 million in penalties assessed for failure to file information returns, obtaining the Department of Justice, Tax Division’s decision to decline prosecution of a taxpayer for alleged tax offenses, multiple cases resulting in complete IRS concession of proposed Employer Shared Responsibility Payments under the Affordable Care Act, multiple cases resulting in complete IRS concession of innocent spouse relief, complete IRS concession of proposed trust fund recovery penalties, and representation of clients in multiple no-change IRS audits. Mr. Borden received a J.D. from The University of Texas School of Law in 2013. While at The University of Texas School of Law, he was awarded the Dean’s Achievement Award for earning the highest grade in Federal Income Tax and maintained a 4.00 GPA in upper-level tax courses. Mr. Borden currently serves on the Board of Directors for the Texas CPA Society and on the Board of Directors for the Dallas CPA Society. He is Chairman of the Editorial Board of Today’s CPA and also serves on the Law360 Tax Editorial Advisory Board. Mr. Borden is a frequent speaker and author on complex tax issues. Mr. Borden was admitted to practice in Texas in 2013 and he is a Certified Public Accountant. "Get Ready for Form 8867, and Related Due Diligence," ABA Tax Times, Digital Issue, Volume 38, Number 2, February 2019. "Ethical Reminders from the Conviction of Paul Daugerdas," Dallas Bar Association Headnotes, Ethics Column, Volume 42, Number 1, January 2017. "TIGTA Audit Reveals Four Opportunities for Partners in TEFRA Proceedings," Journal of Tax Practice & Procedure, Vol. 17, No. 3, July 2015. "Four Things You Should Know About Employer Provisions of the Affordable Care Act," The Dicta, Vol 32, No. 6, June 2015. "IRS Criminal Investigation Current Initiatives Update", Penalties Column, Journal of Tax Practice and Procedures, June-July 2014. "Applicable Large Employer Status Under the Affordable Care Act", Today's CPA, January/February 2014 and Texas Tax Lawyer, State Bar of Texas Tax Section, March 2014. Generally, spouses who file a joint return are subject to joint and several liability for tax deficiencies under the Internal Revenue Code. Yet the IRS may grant a spouse relief from joint and several liability on a joint return in certain circumstances. One mechanism for obtaining relief from the general rule is to seek relief as an "innocent spouse" under 26 U.S.C. Section 6015(f), which authorizes the IRS to grant equitable relief from joint and several liability. Significant changes are coming to Form 8867, Paid Preparer's Due Diligence Checklist, and the associated requirements for the 2019 filing season. On November 5, 2018, the IRS issued final regulations under Treas. Reg. 1.6695-2 to clarify when and how return preparers must conduct due diligence. The IRS continues issuing Letter 226-J notices proposing assessments that are commonly referred to as "employer penalties" under the Affordable Care Act. The letters state that the IRS has made a preliminary calculation of the employer's Employer Shared Responsibility Payment ("ESRP") obligation. Letter 226-J is typically accompanied by Form 14764, ESRP Response; Form 14765, Employee Premium Tax Credit Listing; and states the amount of the proposed ESRP. Employers who disagree with the proposed ESRP must complete and return Form 14764 within thirty days and identify any errors in the letter on Form 14765. In addition, the IRS frequently issues a Letter 227-K or Letter 227-L to provide employers additional information about the proposed ESRP. On June 16, 2016, the IRS announced a new procedure for taxpayers who have had their property seized to file a petition for remission or mitigation. The IRS has identified more than 700 taxpayers that it believes may qualify, and the IRS has been notifying these taxpayers by mail over the past month. Yes, in Vandenbosch v. Commissioner, the Tax Court listed the taxpayers' long-term relationship with their tax preparer as one of the facts supporting its decision that the taxpayer acted with reasonable cause. The 5th Circuit last week vacated the fraud convictions of Mike Baker and Mike Gluk. Mr. Baker was the CEO of ArthroCare Corp., a publicly traded company, and Mr. Gluk was the CFO. The government accused them of violating security laws by fraudulently overstating the gross receipts of ArthroCare. Internal Revenue Code sections 6055 and 6056 were added to the Internal Revenue Code by the Affordable Care Act and impose certain reporting requirements on minimum essential coverage providers and applicable large employers. The IRS recently issued Notice 2016-4, extending the due dates for the information reporting required by sections 6055 and 6056 for the 2015 calendar year. Internal Revenue Code section 4980D imposes a $100.00 per day per employee excise tax on any employer that fails to meet certain group health plan requirements. In testimony before the Senate Finance Committee, a policy analyst with the National Federation of Independent Business testified that 18 percent of small businesses are engaged in practices that may subject the employers to the $100.00 per day per employee penalty. On June 25, 2015, the Supreme Court ruled that the Affordable Care Act ("ACA") individual tax credit, codified in Code § 36B, extends to those who purchase coverage on the Federal exchange as well as those who purchase coverage on a state exchange. The plain language of Code § 36B provides a tax credit to middle- and low- income taxpayers who purchase insurance through "an exchange established by the state." However, the IRS' regulations under § 36B extended the tax credit to taxpayers who purchase coverage through a state or Federal exchange. The Affordable Care Act includes an employer mandate and penalties for employers that do not satisfy the mandate. While the employer mandate may not come as a surprise, the following four aspects of the Affordable Care Act are not commonly known and could be pitfalls for the unprepared employer.